We can’t see it, we can’t feel it, we can’t even interact with it… but dark matter may very well be one of the most fundamental physical components of our Universe. The sheer quantity of the stuff – whatever it is – is what physicists have suspected helps gives galaxies their mass, structure, and motion, and provides the “glue” that connects clusters of galaxies together in vast networks of cosmic webs. Now, for the first time, this dark matter web has been directly observed. An international team of astronomers, led by Dr. Catherine Heymans of the University of Edinburgh, Scotland, and Associate Professor Ludovic Van Waerbeke of the University of British Columbia, Vancouver, Canada, used data from the Canada-France-Hawaii Telescope Legacy Survey to map images of about 10 million galaxies and study how their light was bent by gravitational lensing caused by intervening dark matter. The images were gathered over a period of five years using CFHT’s 1×1-degree-field, 340-megapixel MegaCam. The galaxies observed in the survey are up to 6 billion light-years away… meaning their observed light was emitted when the Universe was only a little over half its present age. The amount of distortion of the galaxies’ light provided the team with a visual map of a dark matter “web” spanning a billion light-years across. This is one giant leap toward unraveling the mystery of this massive-yet-invisible substance that pervades the Universe. The densest regions of the dark matter cosmic web host massive clusters of galaxies. Credit: Van Waerbeke, Heymans, and CFHTLens collaboration. 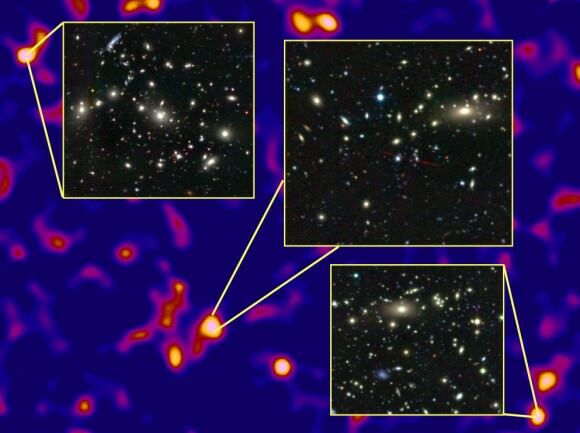 “We hope that by mapping more dark matter than has been studied before, we are a step closer to understanding this material and its relationship with the galaxies in our Universe,” Dr. Heymans said. The results were presented today at the American Astronomical Society meeting in Austin, Texas. Read the release here.